The Nazi State and German Society invites students to view the history of the twentieth century's most infamous totalitarian regime through the voices of people who experienced it. Robert Moeller's comprehensive introduction presents an overview of the Nazi regime, from Weimar to the end of the war, explaining the factors that led millions of ordinary Germans to sacrifice individual rights in the interest of collective goals and national security. The effects of Nazi rule on Jews and other persecuted groups are explored, along with a discussion of why so few people organized against the regime. 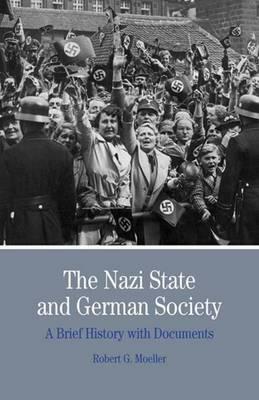 Over 50 documents from a broad range of perspectives bring this history to life and illustrate the effect of Nazi rule on German society. PART I: INTRODUCTION: UNDERSTANDING NAZI GERMANY.- PART II: THE DOCUMENTS.- THE WEIMAR REPUBLIC AND THE RISE OF THE NAZI PARTY.- Adolf Hitler, On His Hopes for Germany in 1914 from Mein Kampf.- 1925.- Magnus Hirschfeld, Sexual Catastrophes, 1926.- Elsa Herrmann, This is the New Woman, 1929.- Adolf Hitler, Anti-Semitic Speech, April 22, 1922.- Adolf Hitler, On the Use of Mass Meetings from Mein Kampf, 1925.- Elsbeth Zander, Tasks Facing the German Woman, January 23, 1926.- Adolf Hitler, Adolph Hitler's Manifesto, September 10, 1930.- Albert Speer, On Joining the Nazi Movement in 1931, 1969.- Melita Maschmann, A German Teenager's Response to the Nazi.- Takeover in January 1933, 1963.- New York Times, Germany Ventures, January 31, 1933.- Poster Critiquing Hitler, 1932.- LIFE IN NAZI GERMANY.- Reports on the Sources of Working-class Support for the Nazis and the Limits to Opposition, 1935-39.- Joseph Goebbels, 'The Tasks of the Ministry for Propaganda,' March 15, 1933.- William Shirer, Description of the Nazi Party Rally in Nuremberg, September 4-5, 1934.- Concordat between the Holy See and the German Reich, July 2 , 1933.- Protestant Church Leaders, Declaration of Independence from .the Nazi State, October 21, 1934.- Adolf Hitler, Opening Address at the House of German Art in Munich, July 19, 1937.- 'Degenerate Music' Brochure, 1939 .- New York Times, Report on a Visit to a Reich Prison Camp, July 26, 1933.- Gabriele Herz, Description of an Early Concentration Camp for Women, 1937.- Reports on Working-class Attitudes Toward the Murder of SA leader Ernest Roehm Adolf Hitler, Speech to the National Socialist Women's Organization, September 8, 1934.- 'Healthy Parents, Healthy Children!' Poster, 1934.- Jutta Rudiger, On the League of German Girls, 1939.- Peter Gay, A Jewish Teenager Remembers the 1936 Berlin.- Olympics, 1998.- Law for the Prevention of Hereditarily Diseased Offspring, July 14, 1933.- SS Security Service, Report Assessing Public Response to the Film I Accuse, January 15, 1942.- Heinrich Himmler, On the Question of Homosexuality, February 18, 1937.- Heinrich Himmler, Fight against the Gypsy Nuisance, December 8, 1938.- Otto D. Tolischus and Frederick T. Birchall, Reports Introduction of Anti-Semitic Laws Marta Appel, Jewish Life after the Nazi Seizure of Power in 1933, 1940 -41.- Inge Deutschkron, Growing up Jewish in 1930s Germany.- 1978 David Buffum, Report on Kristallnacht, November 1938 GERMANY GOES TO WAR.- Adolf Hitler, Speech before the Reichstag, September 1, 1939.- Reich Commissioner for the Strengthening of the National.- Character of the German People, On the Re-Germanization of Lost German Blood, December 1940.- Melita Maschmann, A German Colonizer of Poland in 1939 or 1940 , 1963.- Karl Fuchs, A German Soldier's Letters from France, 1940.- Field Marshal Walter von Reichenau, Conduct of Troops in Eastern Territories, October 10, 1941.- Karl Fuchs, A German Soldier's Letters from the Eastern.- Front, 1941.- 'Total War' Cover Illustration, 1943.- Kathe Ricken, Life Under the Bombs, 1943.- THE PERSECUTION OF THE JEWS AND THE 'FINAL SOLUTION'.- Victor Klemperer, Reflections on the Meanings of the Yellow Star for Jews in Germany in 1941, 1947.- Jewish Cultural Association of Wurttemberg, On Deportation, November 17, 1941.- Ria Broering, A German Woman's Account of Jewish Deportations, April 23, 1942.- Description of a Mass Execution of Jews in Ukraine in 1942,1945.- Heinrich Himmler, Speech to SS Officers in Posen, October 4, 1943.- Chaim Kaplan, In the Warsaw Ghetto, 1939-42.- Hirsh Glick, Jewish Partisan Song, 1943.- Ruth Kluger, A Young Girl's 'Lucky Accident' at Auschwitz in 1944, 1992.- Hanna Levy-Hass, The Bergen-Belsen C.
ROBERT G. MOELLER (Ph.D., University of California, Berkeley) is professor of history at the University of California, Irvine, USA. His work focuses on the history of Germany in the twentieth century, with an emphasis on social history and women's history. His books include War Stories: The Search for a Usable Past in the Federal Republic of Germany (2001), Protecting Motherhood: Women and the Family in the Politics of Postwar West Germany (1993), and German Peasants and Agrarian Politics, 1914-1924: The Rhineland and Westphalia, 1914-1924 (1986). Moeller is faculty advisor for the UCI History Project, a professional development initiative for middle and high school teachers in Orange County, California.